Manchester City manager Pep Guardiola says “racism is everywhere” following the alleged racial abuse of his forward Raheem Sterling in a game at Chelsea. A police investigation is under way into an incident involving Sterling during City’s 2-0 Premier League loss at Stamford Bridge on Saturday. “Racism is everywhere, it’s not just in football,” said Guardiola on Tuesday. Chelsea say they are “fully supporting” an ongoing police investigation. The Premier League club have suspended four people from attending matches while the investigation takes place. A Chelsea statement said evidence of racist behaviour will result in “severe sanctions, including bans”. Social media users posted a video of an incident during which Sterling was shouted at as he collected the ball from behind the goal. England international Sterling, 24, said he “had to laugh” when he heard the remarks because he expects “no better”. After Saturday’s match, Sterling put out a statement on Instagram in which he questioned the way the media portrays black players, prompting a debate between stakeholders in the game. 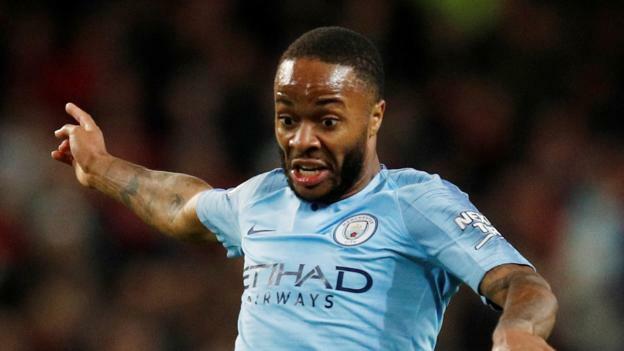 The Professional Footballers’ Association has said negative press coverage of Sterling “emboldens racist rhetoric”, adding the former Liverpool player is “often singled out”. Asked if he thought Sterling faces negative treatment from the press, Guardiola said: “I don’t know. When I arrived here I spoke with him because I know he was so active on social media. Manchester City host Hoffenheim in the Champions League on Wednesday with their place in the knockout stages already secured. Sterling is set to figure with Guardiola saying he only has 15 players available. “It is sad this happens still,” said City winger Leroy Sane about the alleged racial abuse of Sterling. “We are on Raheem’s side.